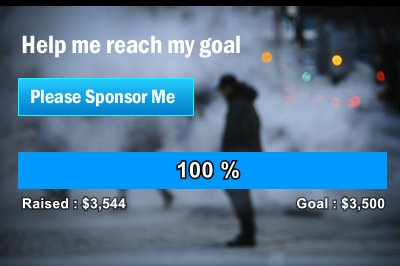 After my last wedding post, you guys gave amazing advice regarding the need (or lack thereof) to make programs. I've decided that I'll leave these until last and only whip something up if I feel that I have the time. 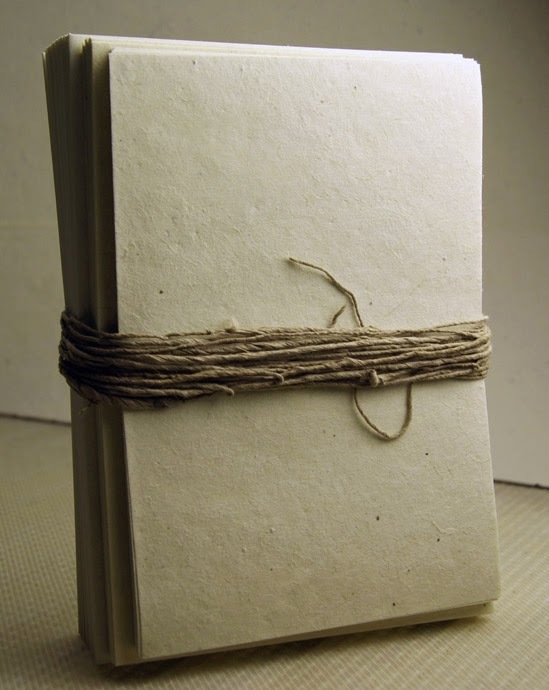 They will be DIY and on recycled paper to save on any unnecessary expense... or footprint. This paper (shown above) really caught my eye because it is recycled and plantable. I figure guests who don't want to keep them (I assume this would include most people) could just drop them in their gardens to grow some herbs or wildflowers. I'm thinking that our invitations will almost certainly be DIY. 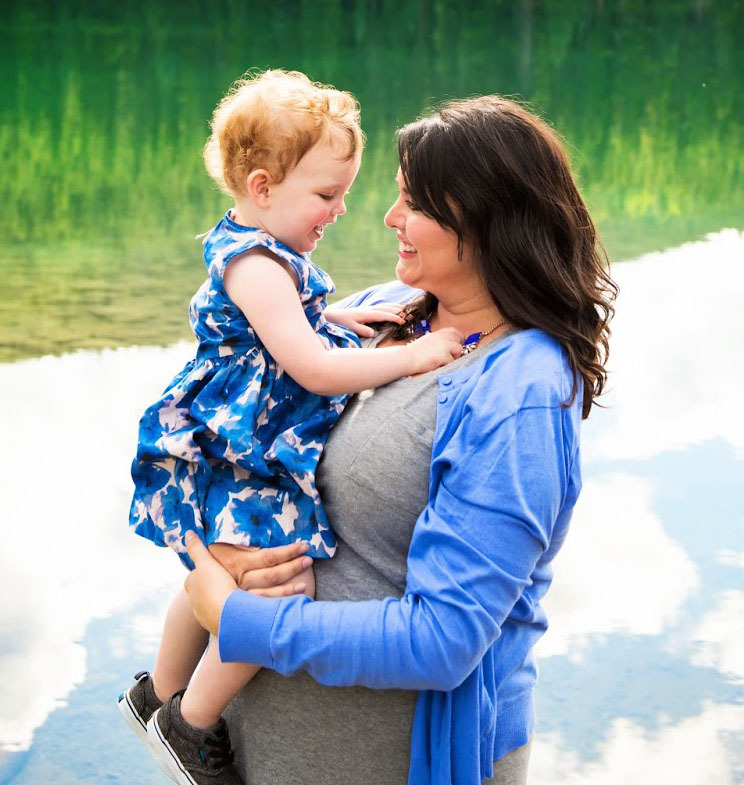 We may have them printed professionally, but we'll want to choose and modify the style ourselves... And, as you know, with a house to renovate and big plans for our future savings, I simply can't justify exceeding our wedding budget. 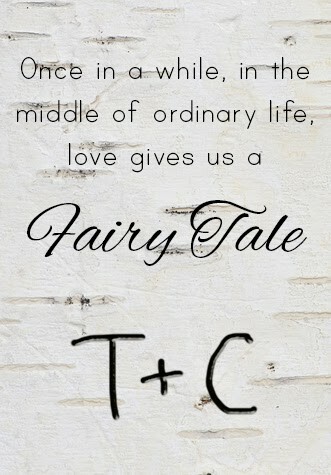 Corey and I like things that are unique anyway and we don't mind spending a little effort to ensure that our wedding reflects our personalities. 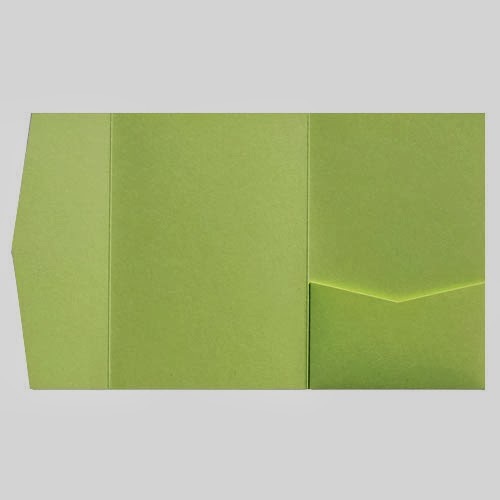 We both love these pocket envelopes in metallic green. 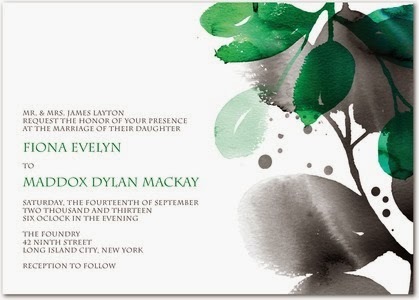 As for the actual style of the invitations, we have a couple of ideas we've been playing with on Photoshop. 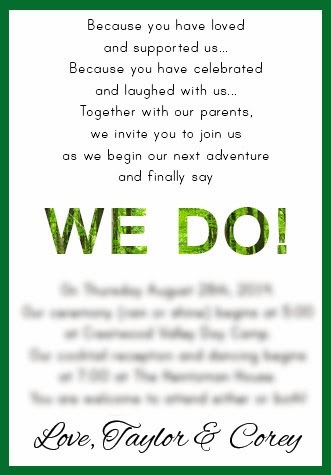 Many of you know that Corey and I met at our favourite camp and be both love nature and wanted to pull "nature" into our theme, while keeping the invitations simple and elegant. I'd love your thoughts on which of the following two three styles looks nicer. Ignore the actual wording, since we haven't settled on that yet. 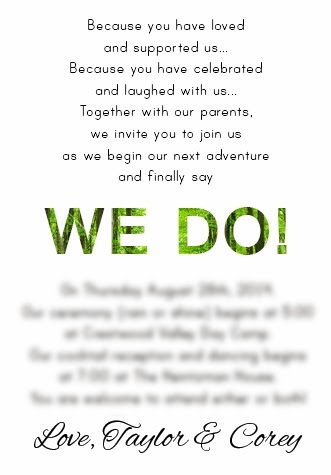 Aside from these two ideas, this version (below) caught my eye, and now I'm wondering if we should incorporate our theme colours a little more in the invitation style. We're having a pretty intimate wedding (mostly family and a few close friends) so we can get away with more casual invitations and probably won't even send save-the-dates. You guys have been so helpful so far that I'm hoping you can solve my invitation woes. So, which version (if any) do you guys like? 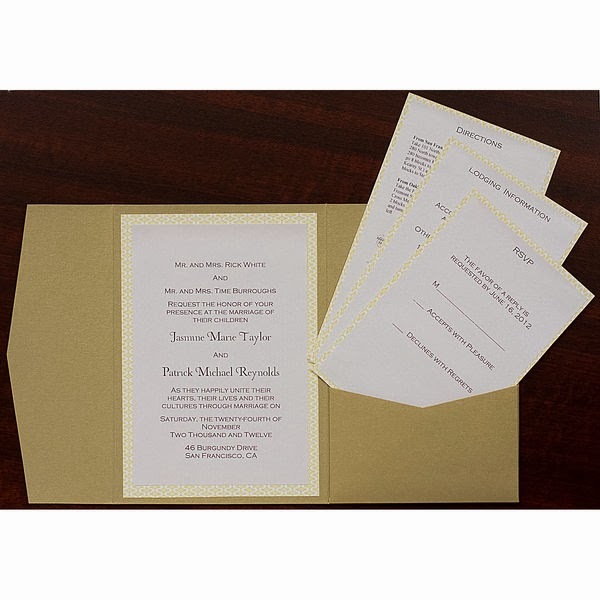 Have any of you seen or done anything really cool with your own invitations that you'd recommend? I'm seriously considering having people RSVP by email to save on paper... what do you think?